My neck of the woods is well-known for its artichokes so figured I should get a recipe up on the blog that featured these amazing vegetables. Not only are they ridiculously beautiful, artichokes have one of the highest antioxidant capacities of any vegetable. Growing up, my mom used to steam and serve them with aioli or homemade mayonnaise. I used to love digging my teeth into the fleshy bits and piling up my stack of leaves as high as I could! For this recipe, I’ve created a deliciously creamy avocado almond ricotta—dairy free and vegan—rounded out with a bit of lemon, garlic and dill. Dive in! 1. Soak 1 cup almond slivers in filtered water overnight. 2. The next day, bring large pot of salty water to a boil. Cut artichokes in half lengthwise. Sprinkle each with a bit of lemon juice and toss into the pot along with the used lemons. Cook for 12-15 minutes. 3. Drain almond slivers. Put in food processor. Add juice of 1/2 lemon, 1/4 cup filtered water, 1 garlic clove, chopped dill (as much as you like), avocado, a couple tablespoons of olive oil, salt and pepper. Blend until smooth. Taste for seasoning. 4. Blanche artichokes in ice bath. This will keep them vibrant and stop them from cooking further. Dry off with paper towels. 5. In a large frying pan, warm up 3 or 4 tablespoons of olive oil and place artichoke halves face down. Fry until golden, about 5 minutes. I fried about 2 to 3 halves at a time. 6. Place artichoke hearts face up on serving platter. Sprinkle with salt, pepper, red pepper flakes, a big squeeze of lemon and ricotta on the side. Serve with an extra bowl to toss in the used leaves. My dear mom makes the best blondies in all the land (IMHO) and thought it would be a fun experiment to try and convert them into cookie form. This is the outrageously delicious result! Basically a chocolate chip cookie meets blondie brownie meets melty yummy salty toffee chocolate chunks! I mean, could it get any better?? Methinks not. Happy baking, you guys! Oh and my guess is Santa would be pretty stoked to find a few of these and a glass of milk beside the Christmas tree. 1. Combine flour, baking soda, baking powder and salt in a bowl and whisk together. Set aside. 2. In a standing mixer, beat butter, sugars, vanilla extract for about five minutes until light and fluffy. Add eggs one at a time and beat a few minute more. On low, add half the flour and beat until just combined then add coffee. Add the rest of the flour and just before combined throw in the chocolate pieces. Turn once or twice more and transfer dough to a container to be chilled for 24 to 48 hours (48 is best if you can wait that long). 3. Preheat oven to 350ºF. Using a dough or ice cream scooper, scoop out dough into 2-1/2 ounce balls (about the size of a golf ball) and place 6 balls on a parchment-lined baking sheet, evenly spaced. They spread out quite a bit. Sprinkle generously with Maldon sea salt. Bake for 12 to 14 minutes. About 8 minutes in, remove sheet from oven and drop it straight down on the counter from a few inches. If the salt jumps off, sprinkle some more on there. Do this once or twice more every 2 to 3 minutes until cookies have golden edges but still slightly undercooked in the center. 3. Let cool on sheet for a few minutes then transfer to wire rack. Serve warm or room temperature with milk, tea or coffee. Nothing shouts fall like warm spices and beautiful squash! 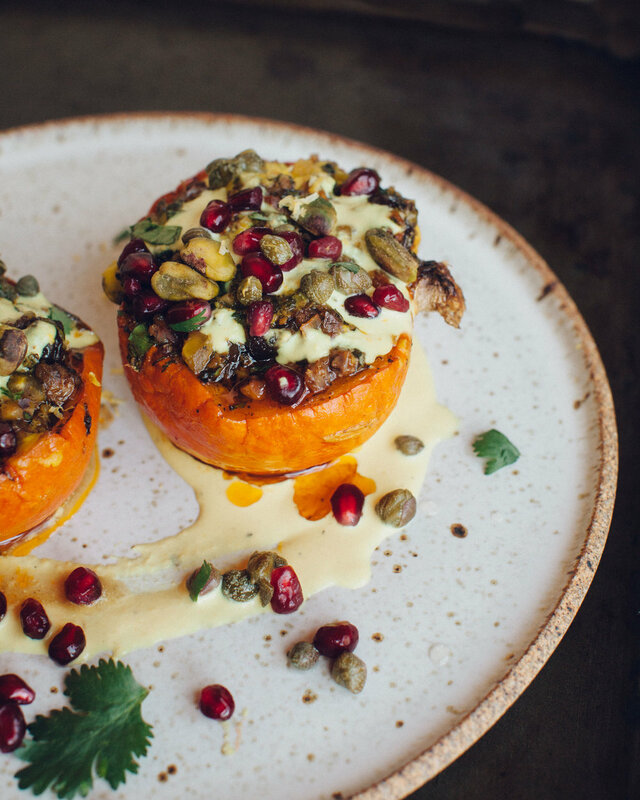 Here they are stuffed with lamb, herbs and dried cherries and topped with a fresh turmeric tahini dressing and a bright relish of pistachios, pomegranate and capers. A beautiful main course to serve at a dinner party, it also makes for wonderful leftovers that can easily be reheated in the oven. Pairs wonderfully with a pinot noir or zinfandel! I personally found one half squash enough to be satiated especially when served with a salad or side. 1. Preheat oven to 425ºF. With a sharp knife, cut squash in half through the stem. Remove seeds. Brush with 4 tablespoons olive oil and generously crack salt and pepper over them. Bake skin side down (see photo) for 30 minutes until starting to brown. Remove from oven and allow to cool on the counter. 2. As the squash bakes, make the lamb filling. Warm skillet on the stove top, add 2 tablespoons oil and once hot add spices and cook for 1 minute. Add onions and cook for 8 more minutes stirring often. 3. Add lamb and cook for 10 more minutes until cooked through. Combine chicken stock, maple syrup, tomato paste and lemon in a bowl, whisk together. Add to the lamb along with the dried cherries. Simmer for 10 more minutes until the stock-mixture is mostly evaporated. Taste for seasoning. 4. Reduce oven temperature to 375º. Distribute filling into the squash. Bake for 20 more minutes. 5. To make the tahini dressing, combing tahini, lemon juice, garlic, turmeric, salt and water. Blend until smooth and runny. Let sit for a few minutes. The dressing will turn yellow as the turmeric really incorporates. 6. To make relish, combine pistachios, herbs, lemon zest, pomegranate seeds and capers in a bowl. Toss. 7. When the squash are finished, remove from oven. Plate by spreading a little tahini dressing down first, then the squash, then more dressing and finally the relish. Serve warm! To reheat: Preheat oven to 350ºF. Add a tablespoon of chicken stock or water to each squash half. Cover with aluminum foil. Bake for 30 minutes. Service with more tahini dressing and relish. A day later, I found the spices really started to make their way into the squash which was wonderful!